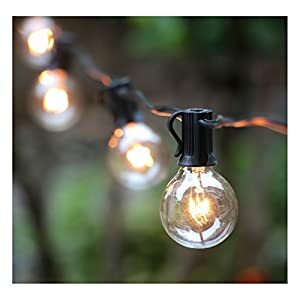 Best Outdoor String Lights Reviews: Top 10 in April 2019! Ever wondered how to create a welcoming atmosphere of coziness in your dark backyard? If so, then let me introduce you to these beautiful best outdoor string lights that will cheer up your garden and your spirits the very moment you turn them on. Fairy lights and open-air events (weddings, birthdays and proms) – are inseparable if you are aiming at filling the venue with an eerie and charming ambiance of joy. Be it on a porch or in the garden, big or small, with lights like these; you can brighten up your nights and enjoy a glass of wine or a cup of hot drink being surrounded by the peaceful, gleaming shimmer. Did you know that our environment resonates with our mood and vice versa? So the atmosphere is essential if we want to keep our minds sharp and clear. I recommend installing a few beaming strings to achieve a harmony both in our soul and mind. 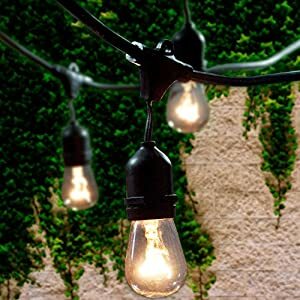 In this article, I will walk you through the top 10 backyard lights so that you can easily choose the string lights for decorating your patio yourself. But before we proceed, there are 3 aspects to consider while choosing your own personal decorative outdoor string lights. Read the specifications carefully. Some of the lights may not be fitted with the waterproof sockets so that you will have to shield them somehow not to put your family and guests at risk during the rainy days. If so, you can use the string lights for decorating your porch, pergola or gazebo – all to your pleasure. If the sockets feature water protection, you can fearlessly install the lights along the guidewire. Also, please make sure that the power connection unit is perfectly secured. Before purchasing the string of fairy bulbs, look at the space you’re planning to light. Where will people spend most of the time? Are there any trees or buildings? How far are they from one another? Answering these questions will help you choose the most suitable lighting for your garden. If the distance between the constructions or the anchor points is long, I insist on using guidewire. It is additional wire to which you attach the lights, allowing to secure your lighting during the extreme weather conditions and keep you and your guests safe. Please note that guidewire is required if the span between the anchor points is over 20 feet as well. Usually, the kind of the fairy lights that we are going to cover in this article have loops, so that you can fasten the cord to the guidewire with zip ties. It is better to use zip ties instead of quick links since the latter are more massive and will pull the guidewire to the ground. This may spoil the general picture and double the chances of someone catching the low hanging bulbs with their head. String lights are useful not only during the winter holidays. In fact, you can keep them gleaming every single night of the year, so that your every day feels like Christmas. With beaming strands like these, you will create a peaceful ambiance to keep you going even in the darkest of your days. 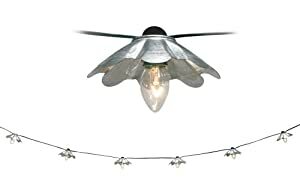 These outdoor fairy lights feature galvanized flower-shaped shades that rest just above the light bulb. 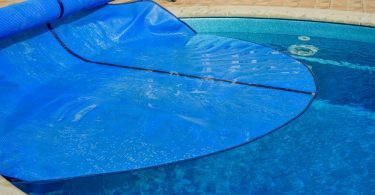 There are 24 waterproof sockets on a 48-ft string which is more than just enough to decorate a porch or a veranda. In fact, you can run a strand like that around a pretty branchy tree, and there will still be some cord left. Each socket has a convenient loop to run the string along the guidewire and a secure molded rubber cover. The space between the electrical outlets is 2 ft. The set includes 24 11W clear old-fashioned light bulbs. Please mind that the shade may feel somewhat loose. Other than that, these are durable and decent lights. These great garden lights create bright and cheerful illumination wherever you place them. These are a part of the Vintage series. Although they look a lot like those from the City series, you can notice significant differences right from the spot. The first thing you notice about these fairy lights is the copper-colored shades, although their shape and size are the same. 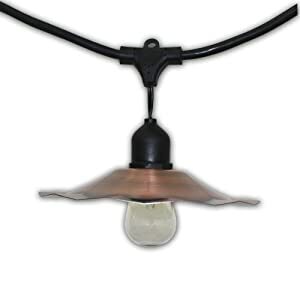 This item includes 15 waterproof suspended sockets spaced 3 ft apart on a 48-ft 16-gauge black cord. Each electrical outlet features a protective rubber cap with integrated loops so you can smoothly run these decorative outdoor string lights along the guidewire or a high wall, as well as to hang them between the tall poles. The sockets drop off the string approx. 4″, so make sure not to catch the socket with your forehead. To avoid that, place them higher than you would typically do if you had the regular string lights. And don’t forget to notify your guests of the low-hanging bulbs if any of them are tall. The string is good for 11W to 25W medium-sized bulbs, but the bulbs are to be ordered separately. Let me get this straight: these garden lights will make any evening activity 10 times better. Why? Because the strand features 10 stunningly impressive lights, of course! Let’s take a closer look. This is a relatively small-sized strand – the string itself is only about 12 ft long, and it features 10 bulbs. The bulbs are secured with a metal cap styled after a flower with 8 clean-cut petals. 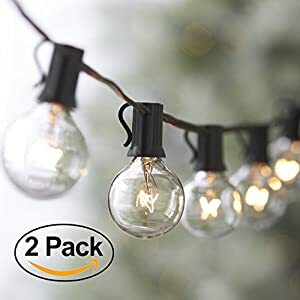 These decorative string lights can be used both outside and inside your home – the high-quality materials allow leaving the strand in the open-air during the storms, and they will still be burning bright like new. 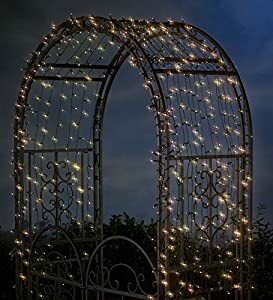 You can also connect several strands if you need to add some illumination to the fence or a wall or want the lights to hang in a fancy manner. They are good to use even on your Christmas tree if you wish! This item requires 10 5W bulbs that come in a set together with several spare light bulbs, an end connector, two fuses and a protective ground wire colored green. Plow & Hearth started in 1980 as a small store that provided home and garden products. Over the years, the business grew larger expanding the range of their products and opening new stores nationwide. The company is also committed to the environmental issues and supports many green initiatives. These solar LED lights also care about the environment. As you can guess from the name, these fantastic solar string lights run on solar energy. No more wires and plugs! To get things started, unpack the lights, throw them over an arbor or a deck, or wherever you are thinking to place them, put the solar panel so the sunlight can reach it, and voila! Now you have your best solar patio string lights bright and shiny for at least 8 hours. Of course, you will have to wait a few hours for the panel to charge, but you get the idea. This set consists of two strands, 50 LEDs each, with the panel located in the center. The LEDs are known for their durability, so don’t worry about a dead bulb killing the spirit of your party – LEDs don’t die. Notably, not the solar-powered ones! I swear, these could quickly become your best outdoor patio lights, and here’s why. Firstly, they feature a heavy-duty cord that can stand any weather conditions – you can put them literary anywhere. 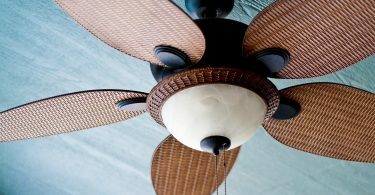 Secondly, Brightech, specializing in innovative lighting, offers the most durable and affordable products in the market. These decorative outdoor string lights have been designed to last. The cord is made with WeatherTite Technology that protects the strand from the extreme weather conditions, allowing your backyard to glow all year round. The 48-ft strand contains 15 11W incandescent light bulbs 3 ft away from one another. The suspended sockets are waterproof (you bet!) and feature a cute loop for simple attachment. The lamps follow the style of the old-fashioned bulbs that create an inviting atmosphere with just the right bit of mystery. You can connect up to 8 strands to one another to illuminate the whole yard. You may also want to consider a dimmer, so that you can change the brightness, creating a softer, calmer mood. Please note that the dimmer and the additional strand are to be ordered separately. If for some reason the lights by Brightech haven’t convinced you, then maybe you’ll want to turn your attention to these string lights by Lemontec. They look pretty much the same, but the price of this strand is somewhat lower. 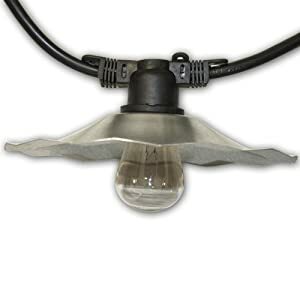 These are commercial, grade, heavy-duty garden lights which can fit in a room with really high ceilings. 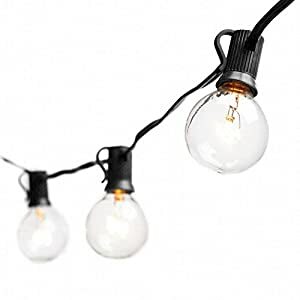 The design of these lights allows connecting up to 8 strings together, and the length should be enough to decorate almost anything. The waterproof cord and sockets will let you keep your yard or gazebo bright and inviting allowing you to enjoy yourself even during the most severe storms. Each electrical outlet has a loop that you can use to fix your string lights to a guidewire or any other anchor points with zip ties or quick links. The cord is 48 ft long and features 15 11W clear bulbs. You can also replace standard incandescent bulbs with the outdoor string lights LED and add a dimmer, but keep in mind that the darker one may not work as efficiently with the LED bulbs as it does with the glass ones. LED bulbs, additional strands and a dimmer are not included in the set – so please order them separately. Another impeccable offer from Brightech, maybe even better than the two mentioned above. This strand features LED bulbs. As you know, the LED lights are the most efficient and long-lasting options. They don’t die, require comparatively less energy and never get hot, no matter how long you had them burning. The string has 15 2W LED bulbs on a weather-resistant heavy-duty 24-ft cord. Each socket is secured and waterproof. So the whole strand will live through the most torrential rains, snows or winds. However, some users can find the LEDs too bright, and, thus, it is recommended to purchase a dimmer as well. With it, you can control the brightness and illumination according to your preferences. These string lights will look gorgeous in a backyard or as a decoration for your gazebo or pergola. However, if you are looking for something to decorate your arbor or a trellis, I would suggest that you look for something smaller. These lights will also look appropriate if attached to the tree branches. Please note that this strand works with a 110V power source only. Also, a dimmer is to be ordered separately. It is my favorite item on this list. Just look at those fascinating bulbs! How perfectly round they are! Moreover, it’s not one 25-ft strand; it’s two of them – all in one set! Now, how cool is that? This means twice as many lights and twice as much illumination. Couldn’t this be the best string lighting for your garden? One string of these lights features 25 G40 bulbs on a 25-ft cord. Remember, there are two strings, which means that all together you’ll have 50 ft of wire and 50 brightly burning bulbs. The spacing between the bulbs is 12″. That means that the lamps sit quite close to each other. But this is a good thing since such design allows better illumination. These are the party lights, because when you are looking at them, and there’s only one thought on your mind – “Let’s have some fun!” Birthday, wedding, graduation or a regular weekend party – with these lights, anything will feel twice as better. They are quite light, so you can use these string lights for decorating any structure that you have in your garden. You can also run them along the guidewire in the air. 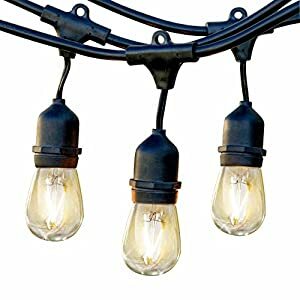 These are neither waterproof nor weather-resistant lights, so consider hanging them in a secured, covered place or take them down when your party is over, not to put any of your guests at risk if the weather seems to worsen. Also, the design allows connecting only 3 strands at the same time. Be responsible! Alright, you got me! These are pretty much the same as the lights by Lemontec we’ve seen in a previous section – these bulbs are too incredibly round and appealing. But this time, there is only one strand of them. Let’s take a closer look and see other differences. There are 25 G40 glass bulbs on the 25-ft long string. It is a regular string, so it will be safer not to hang them in the open air if the storm is coming. The spacing between the bulbs is 12″, so just like the previous item, these are pretty thick. The strand casts a soft relaxing light creating pleasant and joyous ambiance wherever you decide to hang them. I also recommend you to refrain from touching the bulbs – these are not LEDs and they might burn you. Also, some customers say that the bulbs are too fragile and have to be treated with care. So if you are a “fast fuse,” maybe, you should look other options. These are pretty decent backyard lights, and you can connect 4 of them at once. At first sight, it may look like a great lighting option for a party in a forest. If your backyard reminds of a forest, don’t hesitate to purchase them. They’ll also look appropriate in other places, not only the densely vegetated venues. For instance, you might want to use them to light a restaurant, an open-air market, or even a balcony! Their specifications are similar to those of the Lemontec and Luminara Candles: 15 G40 clear Globe bulbs on a 25-ft wire with 12″ spacing. The cord is regular, so it may as well survive through the long exposures to the extreme weather conditions. Not a heavy-duty cord. Due to the light-weight design, these string lights are perfect to use for decoration of tents and other light-weight constructions, like arbors, trellises and so on. The bulbs produce cozy, warm light matching the greenness of the cord – this is how you create comfort! These lights are not very costly, so you can purchase several strings to decorate as much space as the length allows. But please keep in mind that it is not recommended to connect more than 3 strands in one go. As you can see, there is a plethora of decorative outdoor string lights. Heavy-duty cords, light cords, hanging sockets or fixed sockets, with and without shades are all at your service. Anything you can imagine is already there; you only have to know where to look and how to navigate through this diversity of fairy lights. To help you choose your best outdoor string lights, I would suggest that you just stop thinking for a second! You’re not in a hurry, and you need to give your brain some time to proceed the information you’ve just swallowed. It will come to you. Now go get yourself a drink and picture this place you are planning to illuminate. No matter what you choose, the only thing you have to remember about these lights is that the spans over 20 ft require a guidewire. The rest is easy. I believe that this unusual tip will help you to make up your mind and decide what you want very quickly. Hope you enjoyed this article! Feel free to share your thoughts and stories in the comment section below.